In a recent NYTimes article, we find a discussion of bike safety in bike-haven Portland, Oregon. Portland is probably America’s most bike friendly city, so if bikers get killed by cars there, you gotta wonder why. Turns out that most bike accidents happen at intersections. My own bike-car face-off (I lost) of some years back happened at an intersection. It seems that drivers are only really paying attention to a couple of things at an intersection, those being: 1)when will this freaking light change so I can step on it, and 2) I don’t have to stop because I’m turning. This second issue is the one that nails a lot of cyclists, quietly parked off to the side waiting for the green light. 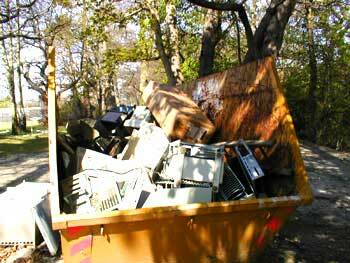 Not enough bulk, not enough chrome, not enough of something that can be easily seen by car drivers. 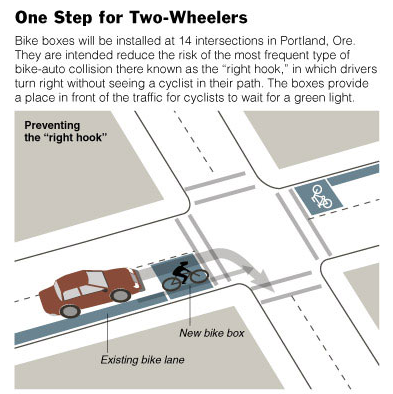 By allowing cyclists to wait in front of motorized traffic, the bike boxes are intended chiefly to reduce the risk of “right hook” collisions, the kind most frequently reported in Portland, in which a driver makes a right turn without seeing a cyclist who is in his path. Drivers will not be allowed to pass through the bike box to turn right on a red light, although many right hooks now occur after the light has turned green, when traffic quickly accelerates. Right hooks were what killed the two cyclists in October, a college student and a bike racer hit by large trucks. The drivers say they did not see them. “In a lot of people’s minds they weren’t doing anything wrong and they were just run over,” said Roger Geller, bicycle coordinator for the Portland Office of Transportation. It will be interesting to see how this works out with Seattle’s neighbor to the South. Seattle is in the process of creating a bicycle task force to help guide development of bike transportation–which currently needs a LOT of guidance.